Richard J. Dunn, 80 of B7 Alpine Court Reading, PA passed away on Saturday, April 13, 2019 at Green Hills Manor in Reading. Born in Fountain Springs on April 30, 1938 he was the son of the late Daniel L. and Bernice (Romberger) Dunn. He graduated from the former Catholic High in Mt. Carmel and attended Wyoming Seminary in Kingston. He then attended the United States Naval Academy from 1957 until his graduation in 1961. He was married on June 17, 1961 in the former St. Peter’s Church, Mt. Carmel to Anita T. (Pupo) Dunn who preceded him in death on September 26, 2015. Richard served in the U.S. Navy Reserves from 1955 until 1957. 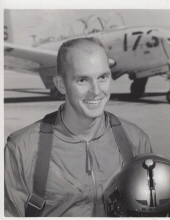 He then went on active duty in the U.S. Navy as a Naval Aviator from 1961 until 1967. After his naval service he worked for the Internal Revenue Service from 1967 until his retirement. He was a member of St. Catharine of Sienna Church in Reading, the Reading Handball Club, the National Rifle Association and the Experimental Aircraft Association. Surviving are two sons, Richard Dunn and his wife Constance of Morgantown and David Dunn and his wife Pamela of Wilmington, Delaware; two granddaughters, Maureen Ann Dunn and Brittany Marie Ribble and one great grandson Quinn Ribble. In addition to his parents and his wife he was preceded in death by one brother, Robert Dunn. A Mass of Christian Burial will be celebrated on Monday April 22nd, 2019 at 11:00 am in Our Lady of Mt. Carmel Church, 47 South Market Street, Mt. Carmel. A visitation will be held on Monday from 9:30 am until 10:45 am in the Joseph J. Stutz, Inc. Funeral Home, 40 South Market Street, Mt. Carmel, Joseph J. Stutz, III, Supervisor. In lieu of flowers expressions of sympathy can be made to St. Jude Children‘s Research Hospital, P.O. Box 2151 Memphis, TN 38101-2151. To leave a condolence to the family, please sign the guestbook at www.stutzfuneralhome.com. To send flowers or a remembrance gift to the family of Richard J Dunn, please visit our Tribute Store. "Email Address" would like to share the life celebration of Richard J Dunn. Click on the "link" to go to share a favorite memory or leave a condolence message for the family.